A Las Vegas Raiders-themed brothel is being developed by prostitution kingpin Dennis Hof. The owner of the Bunny Ranch and numerous other brothels in Nevada is hoping to capitalize off the NFL franchise moving from Oakland to Las Vegas in the next few years. 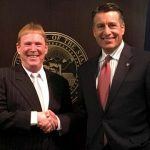 Hof is licking his chops at the prospect of having hundreds of wealthy professional football players in Sin City at least eight times a year. Soon after Raiders owner Mark Davis received approval from the NFL owners to relocate in the coming years, Hof said he would construct the world’s first sports-themed brothel some 25 miles north of Pahrump in Southern Nevada. Prostitution is illegal in Clark County, the home of Las Vegas, but is permitted in neighboring Nye County. 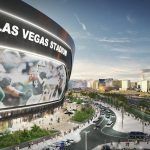 NFL Commissioner Roger Goodell was adamantly opposed to the Raiders eventually calling Las Vegas home, but he was overruled by 31 of the league’s 32 owners who endorsed Davis’ proposal. Goodell cited concerns over game integrity, as Las Vegas’ widespread sports betting could theoretically jeopardize the outcomes should players be enticed to place wagers on their games. Nevada’s legal prostitution is yet another grave concern for the NFL. Hof says the sports-themed prostitution venue will be called the Pirate’s Booty Brothel, and will offer 50 percent discounts for players and anyone who works for the Raiders franchise. It’s worth noting that prostitutes are independent contractors who typically set their own prices. A slew of Nevada businesses, from street vendors selling T-shirts all the way up to casino resorts offering special Raiders-based packages, are expected to dance a fine line around trademark infringement in marketing to Raiders fans. While the cost of legally challenging every business that uses the Raiders’ likeness for its own profiteering often outweighs the benefit, when it comes to being associated with a brothel, Davis and the NFL might interject. Celebrity athletes are no strangers to Hof’s enterprises. The most recent notable case involved former NBA star Lamar Odom. On October 13, 2015, Odom was discovered unconscious at Hof’s Love Ranch in Crystal, Nevada. Odom was in a coma and on life support for several days before regaining concisions. The husband of Khloe Kardashian at the time, Odom reportedly dropped $75,000 for a VIP suite and two prostitutes. Odom’s scandalous history in Nevada dates back decades. In 1997, he accepted a scholarship to play basketball at UNLV, but was banned from the school after it was revealed he had accepted $5,600 in payments from a school booster. During this time, Odom was also cited for soliciting prostitution in Las Vegas.